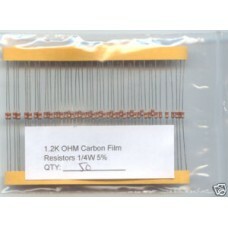 0.1 Ohm 1/4W 1% Metal Film Resistors. Pack containing 25 resist..
1 Ohm 1/4W 1% Metal Film Resistors. Pack containing 20 resistors. 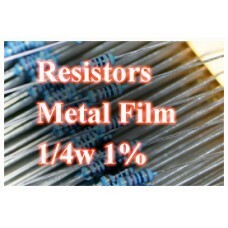 ..
1.2 Ohm 1/4W 1% Metal Film Resistors. Pack containing 25 resist..
1.2K OHM 1/4W 5% Carbon Film Resistors. Pack containing 50 resistors. ..
1.2K Ohm 1/4W 1% Metal Film Resistors. 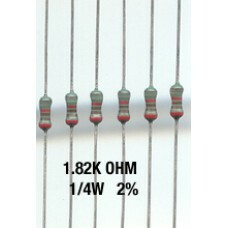 (1200 Ohms) Pack containing&nb..
1.3k Ohm (1300 ohm) 1/4W 1% Metal Film Resistors. Pack containing 20 ..
1.5K Ohm 1/4W 1% Metal Film Resistors. (1500 Ohms) Pack containing&nb..
1.8 Ohm 1/4W 1% Metal Film Resistors. Pack containing 25 resist..
1.82K Ohm 1/4W 1% Metal Film Resistors. Pack containing 50 resi..
1.8k Ohm (1800 ohm) 1/4W 1% Metal Film Resistors. Pack containing 20 ..
10 Ohm 1/4W 1% Metal Film Resistors. Pack containing 25 resisto..